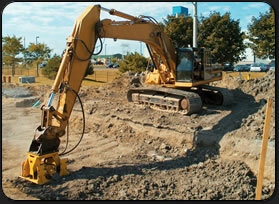 The Magnum RHP 15 is ideal for narrow trench work mounted on 3-7 ton mini-excavators. The 12" wide unit is compact in profile but delivers 6,200 lb. of impulse force. The Magnum RHP 20 is ideal for most loader backhoes and smaller excavators. The unit delivers an unsurpassed 8,820 lb. of impulse energy ensuring all jobs are efficiently completed. The mid-size compactors in our product range are designed to mount on tracked excavators weighing a minimum of 24,000 lb. The largest in the compactor product range is the Magnum RHP 60. This unit has specifically been designed for the 30 ton carrier class and delivers an incredible 38,140 lb. of impulse force at 2,000 cycles per minute.